In 1997, little was known about online gaming. By this time, Bwin.party had already set up its roots in the internet casino industry. Party Casino was established to provide online casino games to an emerging market. 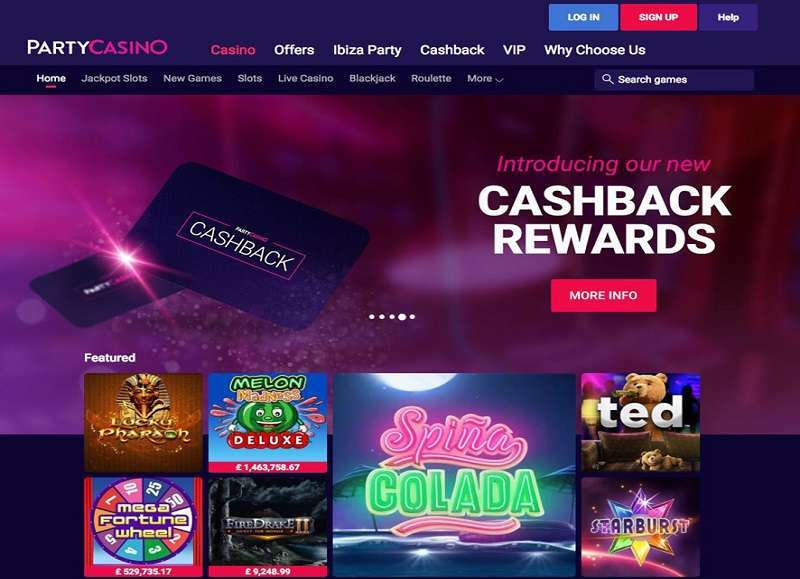 It has garnered a large client base over 20 years of operation and has risen to become one of the well-known online casino brands in the UK. Signing up for membership at Party Casino has its perks. New members can claim a double up offer as soon as they sign up for membership at Party Casino. This package is unravelled once the new player registers a real money account and verifies their email. The process of registration is simple. First, the player has to submit their credentials to build a profile. The information would include the player’s address, their name or alias, and account details. Depending on the new member’s preferences, the account information could be of their bank, credit card or details of any other payment method. This could take less than 3 minutes. After verification is done, the newbie will have a Party Casino account. The debutant then has to deposit at least 15 Pounds to claim the bonus. The casino will match the player’s deposit Pound for Pound to a maximum of 100. For instance, if the player credits their account with 50 Pounds, the casino will advance 50 Pounds making a total of 100 available for the player to use. However, when making the payment, a new member will have to use the bonus code “WELCOMEBONUS” to conclude the transaction. This Party Casino bonus, nevertheless, has some conditions that have to be fulfilled before the extra funds are availed. There is a rollover requirement in place. It is different from how the usual requirements usually work. 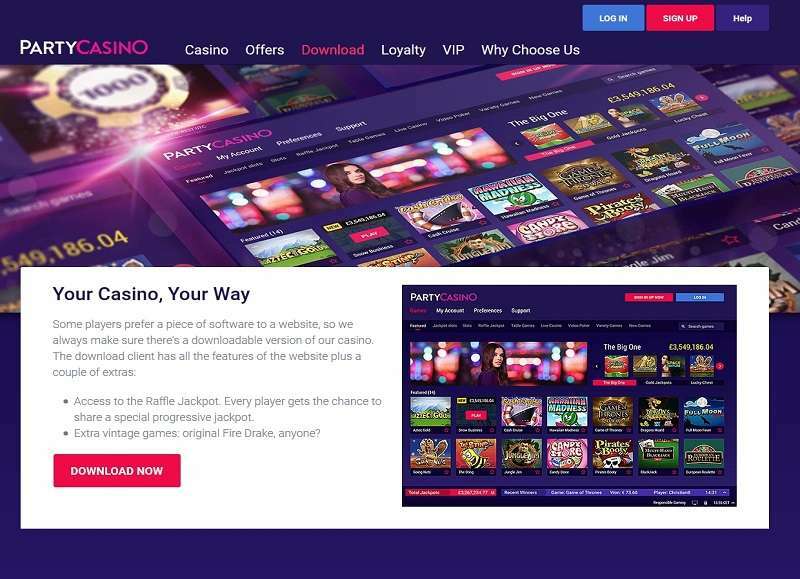 At Party online casino, withdrawal of funds is tied to the loyalty points. A member has to accumulate 20 loyalty points for every 10 Pounds they want to cash out. So, if a player wanted to withdraw, say 2000 Pounds, they would have to have accumulated a total of 4000 points. Keep in mind that the loyalty points are earned by wagering on a few selected game categories. Essentially, the playthrough at Party requires the player to spend some money before they withdraw. Ultimately, and with scrutiny, the playthrough is similar to regular wagering requirements but only presented in a different fashion. The offer expires after 90 days if the rollover condition is not met. When expired, the un-used finances will be confiscated by the casino along with any winnings accruing forth. Further, only new depositing players are allowed to claim this bonus. There are also restrictions regarding jurisdiction. It is prudent that a player ensures that the offer is available for their country of origin before attempting to claim. On the bright side, the bonus funds may be used on any of the games provided under the gaming menu. It would be wise, however, to only gamble in the games that contribute highly towards the wagering requirement. Aside from the double up welcome bonus, this establishment keeps existing players gratefully rewarded. The casino runs a series of promotions from time to time. At the time of this Party Casino review, a reload bonus was running its course for a whole month. Other reward schemes have also been employed in the past and quite possibly in the future too. These include cash prizes, vacations, invitations to exclusive real-life events, gifts hampers, and exclusive giveaways. 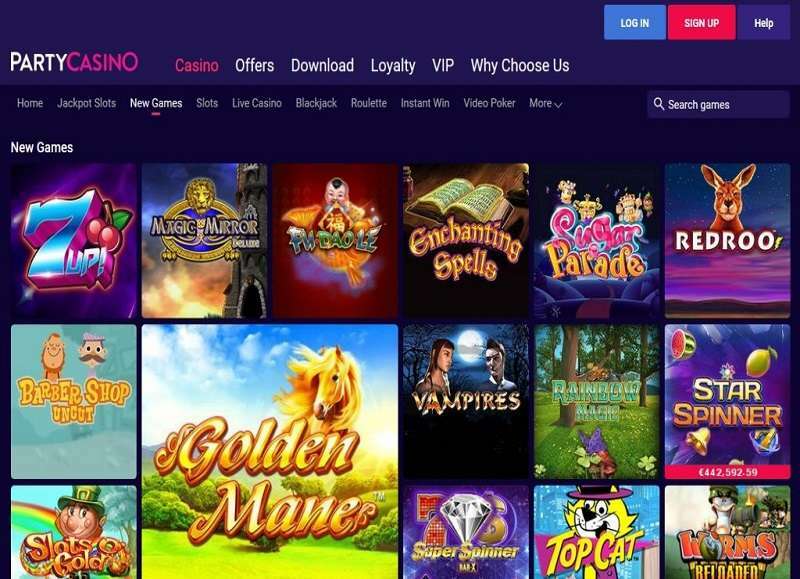 Party Casino is one of only a few establishments that merge their loyalty program with other offers. As stated earlier, the points earned in the loyalty program are used to meet the playthrough conditions. A point is earned every time a player stakes on a game in the casino. However, every game is adjusted to award a different number of points. Slots and baccarat, for example, need a 25 Pound wager to earn one point. The rates are prescribed in the casino’s terms and conditions. It is traditional to inaugurate every player to the loyalty program immediately after signing up. The points will simultaneously begin to accumulate. When the player makes enough wagers to earn 100 points, they may be redeemed for cash, where 100 points count for 1 Pound. Points may also be used to progress through the five tiers of the program. The highest tier is the VIP. Membership in VIP is by invite only. The online establishment will consider whether to invite a player only if they have reached the fourth tier. As the player levels up, they accrue advantages. Of these, faster withdrawals and personalized service are the most enviable. Other benefits include greater bonuses, vacations, cash-backs, insurance bonuses, and exclusive invitations among others. Party Casino supports a number of familiar payment options. Prospective players will be happy to find the methods are both universal and easily available. It will, therefore, be easy to transact online and within record time. Among the mediums supported are credit cards, e-wallets, prepaid vouchers, and debit cards. The methods listed above may be used for deposits and withdrawals. Paysafe Card, however, does not support cash out requests. While deposits are reflected instantly, cash out requests take some time to process. Subject to a pending period, withdrawals are generally processed within 3 and 7 working days. This period depends on the method used. For instance, e-wallets like Entropay, Skrill, PayPal, and Neteller receive payments within 24 hours. Bank Transfer, on the other hand, may take up to 10 days. Limits are also set per medium. Most mediums have a £50,000 maximum deposit and a minimum of £15. Similarly, cashout limits are set according to the method preferred. A perusal of the terms and conditions is vital to understand the limits better. Party Casino takes precautions to safeguard their clients’ money. 128-bit encryption protects all transmissions to and from their site. This encryption prevents the transmissions from being intercepted by a malicious third party. Moreover, customers will be happy to know that this measure is similar to what banking and other financial institutions use. They can rest assured that their money, as well as data, is safe. The Party Casino software is cross-platform. This means that it can be played on mobile just as well as PCs. The casino works seamlessly on Android and iOS devices. The software supports four different languages; English, French, German, and Swedish. The software requires no download; it can be used online by engaging a flash plug-in. Party Casino’s game catalogue has over 500 games spread across the major casino genres. A few of these are exclusive to Party Casino. The others are handpicked titles from NetEnt, Barcrest, Evolution Gaming, WMS, 1×2 Games, among others. The menu offers more than 300 slot games. 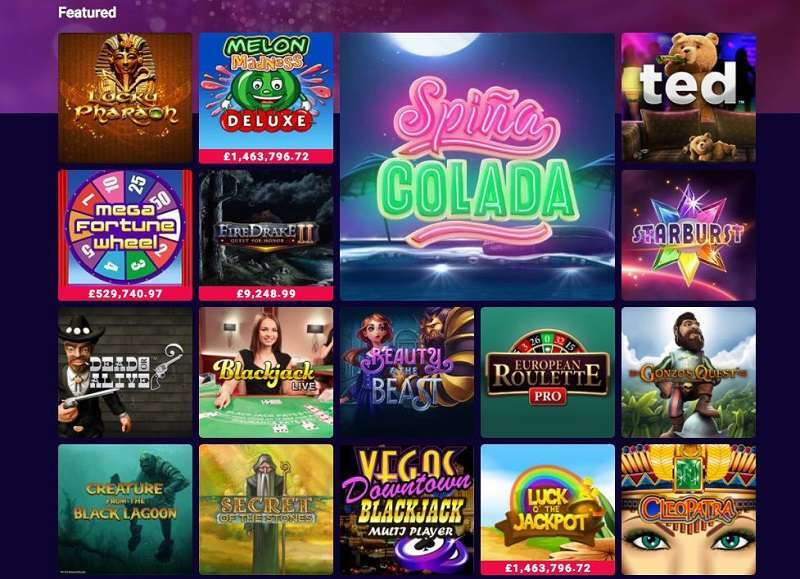 The bulk of the slots originate from Microgaming and NetEnt, although it is possible to find some from IGT, Barcrest, and Betsoft. The slots category is exhaustive since it features progressive slots, classic slots, jackpot slots, five reel slots, and RTP slots. Slot games come in various innovative themes and graphic intensity. Betsoft, for instance, avails a series of 3D slots while NetEnt and Microgaming provide high definition games. Some games have an oblique reference to pop culture like the tales of the talking car – Knight Rider, and famed rock band – KISS, while others are good old brazen themes like diamonds or Asian culture. What is unique, however, is that the jackpot and progressive jackpot slots may share a common pool of funds. A win in Melon Madness would, therefore, reset the progressive jackpot amount in Space Adventure. Evolution Gaming supplies the live dealer options at Party Casino. The feature spans over roulette, blackjack, Casino Hold ‘Em, and baccarat. The diversity of titles might not be as impressive, but the quality of games is superior. The games are cast from Evolution Gaming studios in Latvia using high definition cameras. A player can switch between various camera angles in the game, adjust volume controls, and change the interface language. Moreover, there is a chat function in each live dealer game that be used to interact with the croupier and other players. The croupiers are professionals. They are all gorgeous and well dressed. They will also give the players a tip or two while playing. The croupiers are courteous and serve every player’s reasonable game needs. They can be asked questions about the game, and they will respond appropriately. New players are guided through the basics of the game. Roulette titles can be customized by editing table layouts. Blackjack titles are available in multi-hand options. All five hands can be played at once. It is also possible to play multiple tables at once. Party Casino play online is immersive and entertaining. Members can spend hours sampling the extensive gaming options available in the library. Further, most games can be played for free using the instant play options. For a real gambling experience, however, players are encouraged to try the real money option. Not only does it provide thrills, but it also avails an opportunity to walk away with a high payout. Bwin.party manages the gambling operation. The Republic of Gibraltar has issued a license for all online casino operations carried out by Bwin.party. Effectively, the company is regulated by the Gibraltar Regulatory Authority. The casino is further regulated by the UK Gambling Commission for its operations in the United Kingdom. Any complaints from a member or the casino can be forwarded to the authority for resolution. The Party Casino website is secure at all times. This is illustrated by a little padlock icon at the beginning of the website address. The online establishment also employs industry standard encryption protocols. With regard to fair play, Party Casino bears the eCOGRA seal of approval. The seal is a testament to the casino’s fair practices. Moreover, the individual software providers that collaborate with Party Casino have been vetted and verified. As of 2018, the overall payout percentage of the house stands at 96.23%. The game catalog has unique titles that can only be found in Party Casino. Payments are processed relatively faster than other peer casinos. The establishment supports both online play and download options. Party Casino has been around for almost 20 years. It has built a stellar reputation for its services and comprehensive game collection. The advantages of playing at this establishment are numerous.